We have a marketing policy to beat any written quote on the identical product. 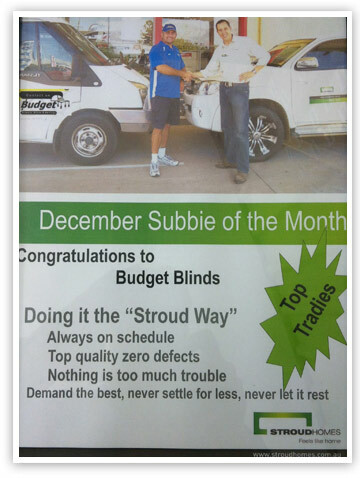 Budget Screens, Blinds & Awnings was created in February 2007 by Mark Hall. The business sells and installs fly and security screens/ doors, internal blinds and external awnings. Mark has been in the industry since leaving school at the age of 15 in 1991, starting as a junior sweeping floors and making fly screens. Mark learnt how to make security screens, assemble vertical blinds and aluminium awnings before becoming an installer in 1999, fitting these products in people’s homes. While installing, Mark also learnt how to measure and sell the products. In 2007, after living at Veresdale for 2 years, Mark realised the need for a business of this industry in this area. Mark started Budget Screens, Blinds & Awnings as a 1-person business, buying all the products in, and doing the selling and fitting himself. By October of that first year, Mark became too busy and had his wife, Kitty (an Early Childhood Educator) join the business to answer the phones, do the paperwork and order the products, setting up an office in a shed on their acreage property. In 2009, Budget Screens, Blinds & Awnings hired their first employee, a local man to make and assemble fly screens and security screens, creating the need for a second, bigger shed on their property. In 2010, another 2 people were hired, one as a junior manufacturer and one as an installer. In early 2011, Mark and Kitty purchased a block of land in the industrial estate at Jimboomba and built a shed to accommodate their growing business, which was ready for operation in October 2011. Once in the new factory, another 2 staff members were hired, one to work as a manufacturer (now 3 in total) and one to be in charge of dispatch. In 2012, the business expanded to making their own internal blinds, therefore hiring another staff member at the start of 2013 to sew the vertical blinds and Mark teaching himself to make roller blinds. In 2014, we have a total of 10 staff completing our team to achieve our goals of offering quality window furnishings at affordable prices and to have regular turnover to keep staff in employment. The goals of the business are achieved by all staff working together as a team, maintaining quality control and providing outstanding customer service before, during and after the job has been completed. The team at Budget Screens, Blinds & Awnings are often complimented for their service – turning up (and on time), knowledge of products, the prices (an obvious admission by the amount of work done), and the quality of products. The office gets numerous positive calls regarding the installers’ knowledge, skills and attention to detail when fitting the jobs. We believe the name of our business is one of our main marketing strategies as it is direct and to the point, helping people remember who we are and what we are about. Budget Screens, Blinds and Awnings has a marketing policy to beat any written quote on the identical product. It is very rare for our customers to have to request a price match from our business, as we aim to give the best price the first time.